So, you know I went on vacation. Today, I want to talk about the quilt tops that I have have been able to get pieced, a quick bit about my quilts that were in my local fair, and then I’ll share a few more photos of the beautiful area around Newport, Oregon. That way if you only want to see quilts, you can stop when it gets to the scenery, deal? Deal! The first thing I worked on during my vacation was piecing together my Star Light Star Dark QAL quilt top. It was a lot of fun to play around with the positioning of the stars and blocks, and I am really happy with how the quilt came together. 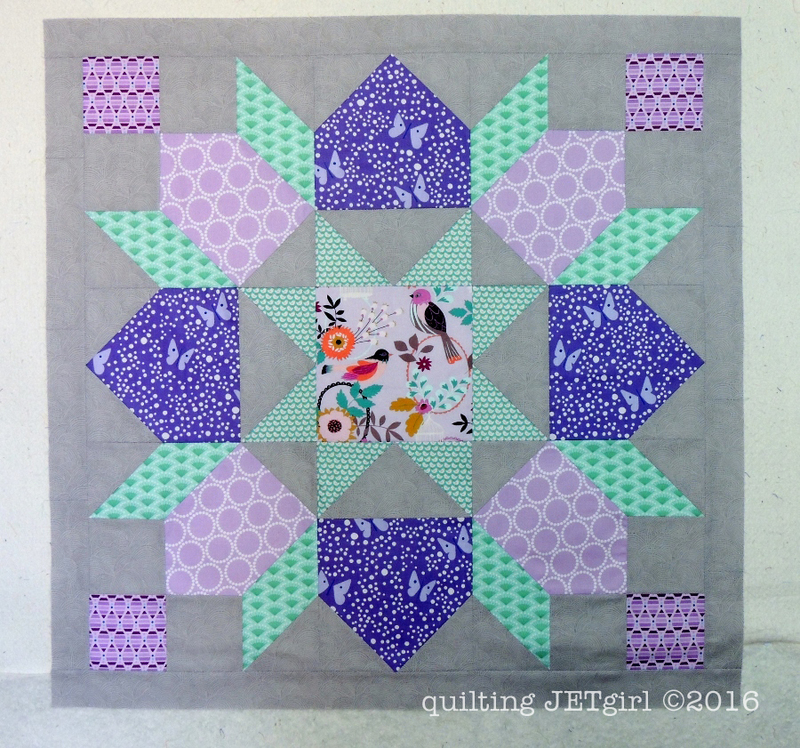 Thanks, Jess @Quilty Habit, for such a fun quilt along! I have a lot of quilt tops to quilt, but hopefully I can get this one finished up soon. Renee and I make up half of the Blue Moon Quilters group, and we are making a 2017 QuiltCon Charity Quilt. 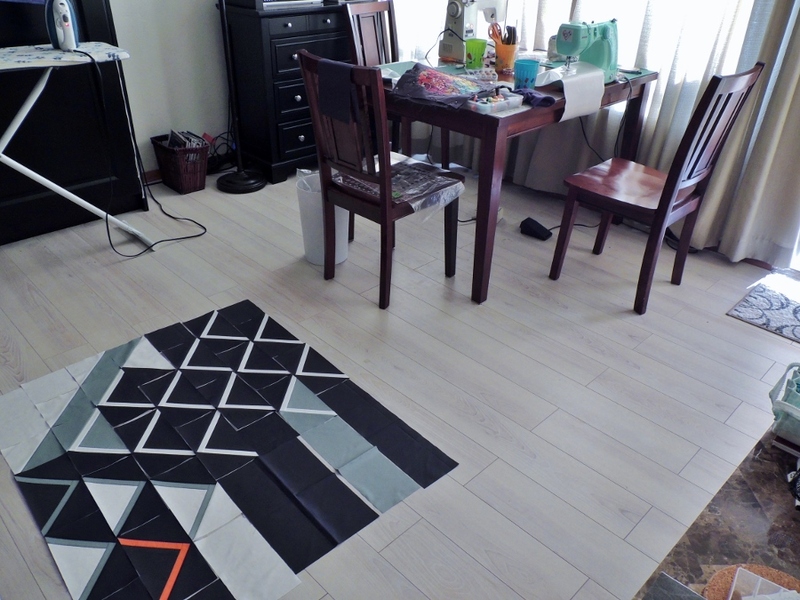 Earlier in August, Renee, Afton, and I were able to get together and cut all the fabric for the paper piecing. 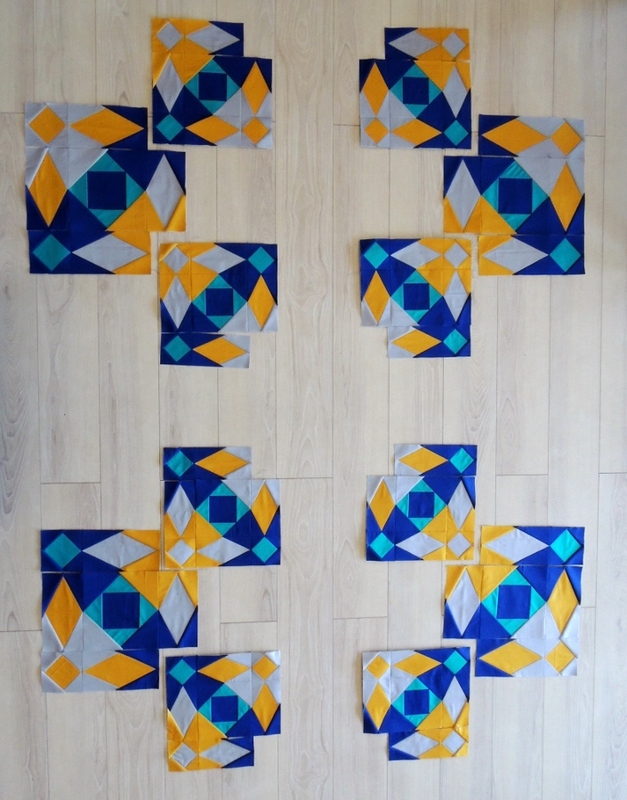 I’m glad I was able to be there for that because my initial pattern writing was wrong for many of the pre-cut piecing sizes we would need (too small – eek! ), but with a bit of scrambling we were able make it work. Renee and I took the 2 larger block sizes for the Storm at Sea based pattern design and we were able to get all the 92 paper piecing blocks complete. We even sewed together the sub-assembly units that will be needed when it is time to piece the quilt top. I am really excited to see this continue to evolve. Many thanks to our sponsors Michael Miller fabrics, who provided the wonderful Cotton Couture fabric we are piecing with, and Aurifil, for supplying piecing and quilting thread! I did a few other secret sewing projects that I’ll be able to share with you soon. Once that was all complete, I had enough time to get all of the piecing done for the QDAD QuiltCon Challenge quilt, Downstream. It isn’t a pieced quilt top, yet, but it will be soon! You can also see our sewing setup in this photo. I’d like to thank Renee for letting me borrow a small travel sewing machine for the trip. Hopefully I’ll have some fun finishes to be sharing in the upcoming weeks! While I was away, my local fair was held. I am sad that I was not able to go and see my quilts on display (I entered The Humans are Dead and Snowflake Shimmer in Gray). 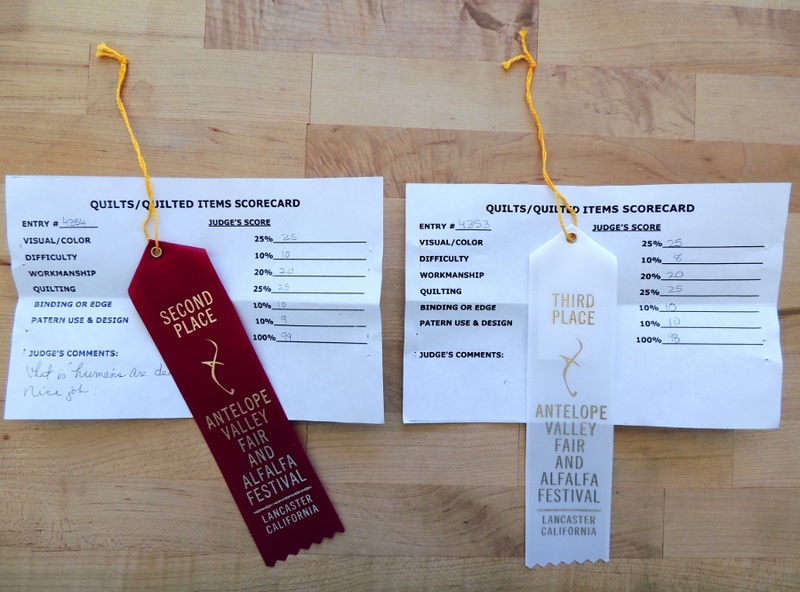 Thankfully a friend was able to go and collect the quilts for me while I was gone, and I was thrilled with the scoring and to have won ribbons! Again, it was too bad I didn’t get to see the quilts that were entered. Oh, and I have to laugh at the judges comment, “What is ‘humans are dead? '” Yeah, without the backstory, it’s just weird. I get that. What a difference the fog can make! The photo on the left was the view from our porch the evening Renee and I arrived. The coast was covered in fog and our drive along 101 didn’t reveal any coastline. We were very surprised days later when we retraced some of the roads we drove and were surprised to see how close we had been to the ocean without knowing it! Thankfully, the fog rolled in and out while we were staying and for the most part we were treated to clearer views and more lovely sunsets during the week. The photo on the right is the last sunset we saw. We stayed almost in the middle of about a 5 mile long stretch of walkable beach. To the north were rocky cliffs leading up to the Yaquina Head lighthouse and to the south it was blocked by the north jetty. We didn’t find much along our local beach in terms of sea glass or shells, but on one of our first days there were lots of jellyfish. I really like having Renee’s hand for size reference. I love watching sandpipers on the beach, and I thought this was a particularly lucky photograph of them in midflight after being startled by Renee. I like seeing their reflection on the wet sand. Renee and I climbed to the top of the lighthouse (okay, as far up as they would let us climb, anyway), and the views were amazing. When asked to rate how interested we were in lighthouses on a scale of 1 (let’s get this over with) to 10 (I planned our vacation around seeing this lighthouse), we figured we were in the 4 to 5 range. I was absolutely fascinated by the tour, though, and it is neat to say I’ve been in and climbed up the tallest lighthouse in Oregon! The lighthouse still uses its original 1868 French-made, 1st order, Fixed Fresnel lens, which is apparently visible 19 miles out to sea. The view from the top was stunning, and I was glad we saw it on a very clear day. Also, with that much light and glass, there were rainbows. Beautiful, lovely, amazing rainbows. We also paid a visit to the Devils Punch Bowl State Natural Area. At high tide, water rushes in an booms around this naturally made dome, but at low tide you can walk along the beach and go inside. The view from inside the Devils Punch Bowl was really neat, and the occasional larger wave would cause a “boom” that always caught my attention! Those are my best photos from the beach retreat and thanks for humoring my sharing about it! 98%, and 99%, and that fab stitching on ” The Humans are Dead”, what a wonderful setting on the machine, perfect. Congrats on the ribbons.Lovely beaches, those photos make me long for a few days away somewhere just like that. I love your art quilt “The Humans are Dead”. That little guy does look kinda shifty and sinister to me. I have always been amazed at transparency in quilts and I have been playing with the idea of adding that element into quilts I make. Thanks for further inspiration. There may be a lookalike in my future. Looks like a very productive vacation. The storm at sea variation is intriguing and I looking forward to seeing how the group finishes it. Congratulations on the ribbons. Your scenery photos are wonderful. SO GLAD you shared these photos Yvonne! Thank you; they are marvelous. I can gaze at ocean and water photos (you may have surmised that) forEVER, and I love that lighthouse! I will look it up; we were on 101 in 2007 and I wonder how close we were to it. Another good friend and her husband stayed in Heceta Head Lighthouse, yup IN it, a few years back..reading your post and hearing about her stay make me want to go back there. How wonderful to have done this with Renee. Love the hand and jellyfish shot, yes, but HOW you did it, catching the top of her sunhat ,is really striking. I would have never thought of that–maybe you should enter that photo in your fair next year! Congrats on the ribbons–might be why many quilt shows have a little helpful paragraph about the quilt! And LOVE your Starlight quilt, and the Lucent colours. Great post, thank you for starting off a day with such a massage to my soul, quilts and nature. Mmmm. Thanks so much for sharing the vacation and quilt photos. Congratulations on your ribbons! I can’t imagine what the quilts that were 1st looked like. Yours are beautiful! Wonderful vacation photos! We went to NC’s Outer Banks last year just to see the wonderful lighthouses there. Great finishes too, congratulations on your ribbons! Congrats on the ribbons. Love your vacation photos but I must say that I’m a little homesick now. I grew up on the east coast of Canada, in Nova Scotia, so I miss the ocean a lot of the time. Beautiful pictures and thank you for sharing. Thanks for sharing the progress on all of you projects! All beautiful! And I thoroughly enjoyed your beach photos! And congrats on your ribbons at the fair! Awesome! I love your photos, Yvonne. These photos really are something to use as “jumping off spots” for quilts, so keep them coming! And I love to see places I’ve never been, especially viewed by someone with an eye for texture, colour and the environment. Gorgeous beach pictures! The fog…I loved seeing the fog! It looks like you had a wonderful and productive vacation! What a way to spend a vacation! Your sewing vacation was very productive! Thanks for sharing both the quilting photos and the ocean views. How fitting that you were working on Storm at Sea blocks while enjoying the seaside! I really love Downstream – it will really be fabulous when you get it all quilted up. Wow! You have been busy and very productive. I especially love your design for the collaborative challenge quilt. Congrats on your ribbons and the excellent scores. What great photos…both of quilts and the beach! Thank you for sharing. I’m looking forward to seeing the 2017 Quilt Con Charity quilt as it comes together. I also like Downstream and think the color choices make it very dramatic. Lots going on in this post Yvonne. First of all, I love your Downstream piece and look forward to seeing it finished. Striking! Congrats on the ribbons at the fair. I have yet to enter a quilt in our local fair but I believe I will force myself to do it next summer. I need to get past my anxiousness about putting myself out there. Finally, I could look at vacation photos every day. I love them so thank y for sharing yours. It is a fun way to get ideas of new places to go and it also gives your refers a glimpse into the other bits of your life and I treasure that. Oregon has such pretty coastline. The charity quilt is looking so, so awesome. You and Renee had such a productive retreat. Sara and I better get cracking! I grew up in Oregon and what a joy it was too. Now I live in the UK and it always gives me homesick pangs when I see photos or read about Oregon. Blimey, you got a lot done on your break! I love your photos – who would want to skip them? I was really happy to see a lighthouse but the sandpipers photo is my favourite; you captured the moment perfectly. Thank you for sharing your photos of your vacation. They are really lovely and make me want to go to the ocean, and possibly a lighthouse. I am loving the progress on Four Greater Than One and Downstream. These two quilts are very inspirational to me. And congratulations on the ribbons! That sounds like the perfect little vacation getaway. Walks on the beach, sewing, and visits to an historic lighthouse, what more could you ask for? You’re definitely going to have a lot of finishes in the next few weeks. I’m really looking forward to seeing Downstream when it’s finished. I love the design and that bright pop of coral color. So many fun adventures to share! Congrats on your ribbons from the fair. 🙂 I am absolutely loving the charity quilt progress so far, it is stunning already! And more fun pics from your vacation, yay!! Beautiful pics! Congrats on your ribbons! What a great collection of quilts and beach! That Devil’s punchbowl looks fantastic to hang out in and the lighthouses. How spectacular. The downstream quilt looks great, the pop of color really works well. Congrats on a successful vacation! Thank YOU for sharing your vacation photos!!! I know some people only want to see quilts on a quilting blog, but I l-o-v-e seeing more! Adds dimension and context for the quilty parts of life. 🙂 What an excellent sewing retreat. You accomplished a lot, and clearly enjoyed your surroundings. Nice! You have some really great quilts being worked on!! Congrats on the ribbons 🙂 Your vacation looks like an amazing time! I’m quite impressed with the level of productivity you were able to achieve on your vacation and site see. It’s so hard to believe that the sunset pictures are taken at the same place. That was some pretty think fog. Hopefully, the creative juices are flowing after your trip and that line up of quilts will be completed in no time. Your vacation pictures are gorgeous! Thanks for sharing them 🙂 Downstream is looking great, as are all the others you’ve been working on. 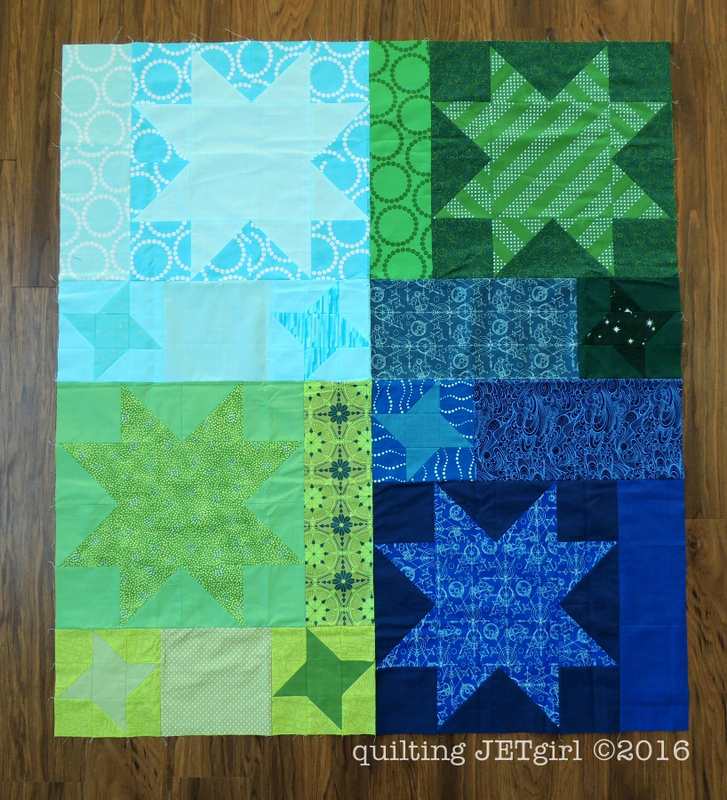 I love the collaboration quilt…so many pieces! So many fun things going on. Downstream is especially cool. My daughter and her fiance’ just got back from the Oregon coast and saw many of the same things. Beautiful. I have long been fascinated with lighthouses. I would have booked myself on that tour in a flash! I blame the Goodies (old British TV show).